Argument. The axis of a major augmented triad, fg-cd-GA, rises by-successive third tones, the extremes alternately resisting and yielding to the advances. This is the simplest song of the series, consisting of repetitions of a salient major third, generally redundant, from a reiterated note, every other duplicated and punctuated by a pendent fourth, generally redun�dant also, and every fourth one followed by another in which the upper instead of the lower note is reiterated. Divided notes (B2 to B4, the omission of the duplicate third in A5 and A7, and the introduction of a duplicate in C3 and C5 vary this rudimentary scheme. The chief formal features of the song are again a displacement of its axis and an attendant shaping of its figure. 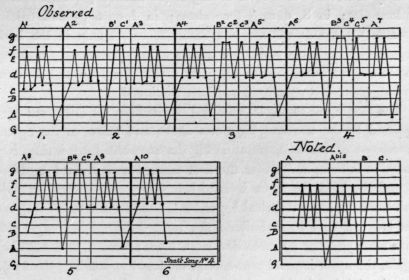 Conceiving the per�formance as consisting of four complete strophes introduced by the final segment of a fifth and closed by the initial segment of a sixth, the singer raises the axial note an approximate third tone in passing from each strophe to the next, with one exception (4 to 5) where it remains constant.